The final McKinsey “timeless tests” looks at how to anchor customer centricity within the organisation, and align governance approaches and staff incentives to fit with the new customer service ethos. 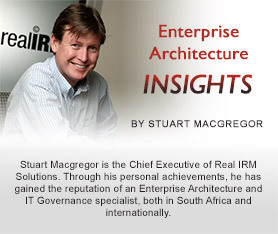 From an Enterprise Architecture perspective, this is reflected in the maturity from ‘EA execution’ to ‘EA leadership’. The concluding article in our series on change management in EA highlights the the hallmarks of a mature-state EA practice – the state of EA leadership. But the reality is that so few firms ultimately realise the value of EA in their customer experience and digital transformation ambitions. Another of our series – on what catastrophes often cause the EA practice to implode – addresses the common reasons for this. Because so few organisations fully leverage the power of EA, those financial services firms that do get it right, have a tremendous competitive advantage over their peers – who continue struggle away in disjointed silos, bondaged in unnecessary red tape. Addressing these final two McKinsey tests requires a relentless focus on customer insights; and then ensuring the voice of the customer be heard when structuring, integrating or re-designing all business processes. "Without EA at the core of these endeavours, the organisation's leadership cannot take full advantage of these rich sources of insights." Without EA at the core of these endeavours, the organisation's leadership cannot take full advantage of these rich sources of insights. More specifically, they wouldn’t have the architectural work products to improve resource allocation, reduce decision-making biases, assess strategic alternatives, manage change and complexity, or chart the innovation journey. In this way, EA provides deeper insights into the unintended consequences of certain potential decisions – like company restructuring or deciding to enter a new market. To conclude, the McKinsey tests represent the important questions that financial services organisations need to ask themselves as they seek to put the customer at the heart of their digital transformation initiatives. And, as we’ve teased out in this series, having the fundamental architecture to support these goals, and prepare for an uncertain and volatile future, is an absolute prerequisite for success.